A simple mod that scriptedly adds home plate to the supply line list and builds plug and play supply lines, without any requirements, from it to other settlements (for now 29 vanilla and all DLC settlements). The term "Users can not use my assets in any mods/files that are being sold, for money, on Steam Workshop or other platforms" includes the situation of receiving any direct or indirect related income, including donations. 02/08/2017 Add support for Fizztop Grille in Nuka World. Sorry that I could not fix the mod and may never have the time to do that. If I lived through being forced coercively to work 13 hours with 2 hours traffic time every day and without any holiday or weekend for two years, I would be eager to come back and get it done. Any one having intention can take over the mod and upload his/her own one in Nex. 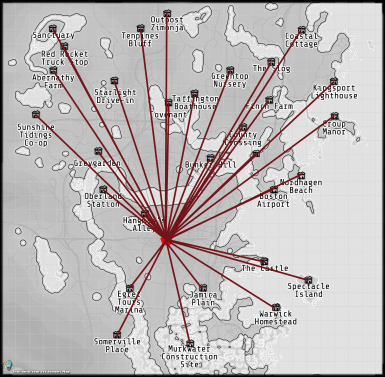 Like vanilla supply lines' function, this mod automatically shares some resources among workshops in settlements . I just centre Home Plate and register supply lines from it to all the other vanilla and DLC settlements. Theoretically all registered settlements have the cloudy storage. 1. Completely register Home plate as a settlement. 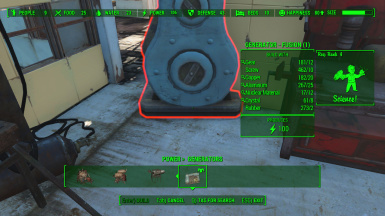 The mod only adds the supply lines, and they will not appear on the Pipboy. 2. Completely share all the stuff in the workshop container. Someone said that simply linking all the workshops refID to just one container will exceed the limit and crash the game. 1) from 0.6beta to 0.61: simply override. 3) [Optional files] Simply override or uninstall. No scripts or quests are changed. Just link the temporary workbenches(not workshops) to the workshop of Homeplate. Should be compatible with most mods except those having the function of canceling supply lines. But I have not canceled a provisioner ever before and I do not guarantee that situation. Tested on both a new game and my lv78 character; whether built-already or newly cleared settlements, or Home Plate. This mod only modifies the DiamondCityPlayerHouseLocation "Home Plate" [LCTN:00003967] and adds a quest. 1. Gather more information of uninstalling the mod. 2. Add all the other dlc settlements to the script. 3. May make some compatibility patches to some home mods. 4. May add some conditions to the function(perks, caps, lv, etc.). 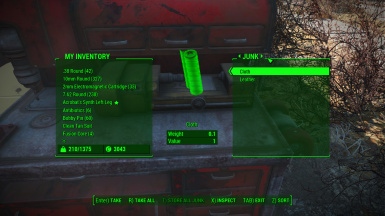 After uninstalling the mod, share storage of HomePlate disappears but other vanilla settlements still have linked resource.